Explanation of War (Mil-Kha-Mah) in Hebrew ~~~ Traditional Judaism offers an intriguing perspective into the Biblical concept of war. Some Rabbi’s teach a dimension of the glory of God shines through each individual letter of each word in the Old Covenant. Since Hebrew is the original language in which God communicated to His people, every letter of every Hebrew word communicates something of His nature. Not surprisingly, that the Bible says, the enemy prowls around “…looking for someone to devour” (1 Peter 5:8). He is obsessed with destroying God’s created order, and then he feeds on that very destruction. By no co-incidence, his first battle on earth inspired man’s illegal act of “feeding” from the tree of life, and in his final mil-kha-mah, Satan himself is devoured by a lake of fire (Revelations 20:10). Let’s next look at the meaning of WAR associated with the individual letters associated in Mil-kha-mah. The first letter “M” (Mem) represents – “waters.” Water is the primary physical substance of the created earth realm (2 Peter 3:5; Genesis 1: 1 – 2, 6: 10). The Hebrew word for “heavens” contains within it the word for “waters,” suggesting the heavens were also formed – mostly from water. Water is used frequently in the Bible as a metaphor, not just for life, but for death by divine judgement. The second letter of Mil-kha-mah which is “L” (Lamed) means “teaching and learning.” The Hebrew concept of teaching and learning involves more than mental activity; the educational process itself impacts reality. The next letter “Kh” (Khet), refers to an “enclosed of defined area.” Then comes “M” (Mem) again, symbolizing waters; followed by “H” (Hey), which denotes and “opening or an open window.” Hey is also used to represent God’s Name. Putting these letter concepts together in the same order as they appear in Mil-kha-mah, WAR is viewed from a certain prophetic perspective. By this reasoning, war is used by God to release life (waters) for the sake of His teaching and meditating, in a defined sphere and through an open window of time and space, more of Himself. In connection with its root definition, war is God’s means of devouring the devourer. To a fallen world, therefore, war becomes necessary for ultimate justice and good. The goal is always the reality of greater life in Him and His ever expanding Kingdom. War was first conceived in heaven when Satan rebelled against God (Ezekiel 28:13 – 17) and there will be war in heaven again (Revelations 12:7). Adam and Eve’s subsequent sin in the Garden of Eden enabled him to take his ruinous rebellion to the staging of earth. Centuries later upon the exodus from Egypt, the Hebrews, were attacked and responded with force (Genesis 14: 14 – 16; 34: 25 – 31 and Exodus 17: 8 10). Much as God’s Kingdom is ruled by love, Satan’s dominium is ruled by fear. To the extent that we surrender to a spirit of fear, we surrender to the enemy. Our fear feeds and empowers the demonic devourer. Conversely, genuine faith leads to our surrender to the Captain of the Heavenly Hosts. It empowers alliance with the angels of heaven. For this reason, Israel’s battle refrain resounding throughout Scripture is designed to stir-up faith: “Be strong and courageous” (Deuteronomy 31: 6 - 7, 23; Joshua 1: 6, 9, 18; 10:25; 1 Chronicles 22: 13; 28: 20; 2 Chronicles 32:7). The word “strong” Khazak stems from a Hebrew word that means “to cleave.” And, the word “courageous” Amats comes from the root “to be alert.” To be strong and courageous, therefore, is to cleave to the God who is the Commander. We watch Him and we watch what He does amid all that is happening. As believers in Yeshua (Jesus), Israel’s timeless war cry can also be ours today; “Be strong and courageous” – Khazak ve Amats! The patriarchal tale with Isaac’s pregnant wife Rebecca finding herself enduring a “feud in the womb,” mopping her brow and puzzled before God: “Why is this happening to me? Again, as with Isaac the child of promise and Ishmael the child of Hagar the maid-servant, the war in Rebecca’s womb is a war of election! Jacob deceives his father and disguises himself to steal and this time seal the birth-right blessing Genesis 27:28 – 29. The war in the womb continues today through the son’s of Esau (descendants of the Edom, Amalek) – (Exodus 17:14) who are devastated, embittered and still bent on revenge against the son’s of Jacob. In a sense the war of the womb between Jacob and Esau has yet to end. With the inception of the modern Jewish state, their struggle has resumed with a vengeance, this time playing out on Israeli soil. The mindset of the Arab world is that it can loose 99 wars; all they have to do is win the 100th one! Today the Muslim, Arab nations have persuaded the World Powers; consisting of many nations, political organizations and the Church organizations (those believing that they have replaced Israel) throughout the world, to help in the “land for peace plan” (the big lie!) are closing in on Israel. They have brought her to the edge of war. And, these plans are all contrary to the Word of God. We have a fair and loving God. He has allowed the Middle East – peace / war process to play out on the world stage. 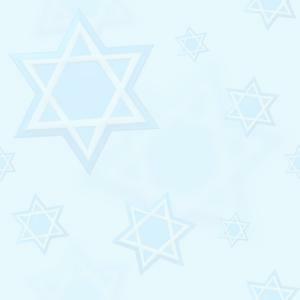 He is now allowing the organizations and nations of the world to express their positions publicly pertaining to Israel. Israel in the 21st Century has found herself having to fight a war on two separate fronts; one via the military and the other via the media. Throughout the Muslim world, generations have been raised on barbarously anti-Semitic literature, including poisonous Nazi materials that have long been mainstays in their schools, stores, mass media and political institutions. Whole generations have been indoctrinated since early childhood with lies about the Jews - - lies that enflame Jihad against Jehovah. And, sadly it continues to this day. Muslims are well aware that true Christians are Israel’s staunchest supporters! They seek, therefore, to drive a wedge between the Church and the Jews, using media outlets, sermons, seminars, and even “Christian” tours to the Holy Land. But, the Palestinian presentation is largely under verified - - by the facts of history. Biblical perspectives are offered that amount to updated versions of “Replacement Theology.” The well oiled Islamic propaganda media machine is a weapon of mass destruction bent on the destroying Israel. We live at a time when Jerusalem has truly become the "burdensome stone" of the last days prophesied in the Scriptures (Zechariah 12:3). The Palestinians consider East Jerusalem to be their capital and unwilling to accept a Palestinian state that does not include it. The EU has made it very clear that their position is that East Jerusalem is going to be the capital of a future Palestinian state. Even the United States has made it the official policy that East Jerusalem is part of "the West Bank" and is pressuring Israel very hard to stop all construction in East Jerusalem. But Israeli Prime Minister Benjamin Netanyahu has declared that Israel will never give up control over any part of Jerusalem! It is a mistake to view Israel as just another nation! If one was to have predicted any time prior to one hundred years ago that the Jews would return to Israel, Jerusalem would again be the Capital, the land would produce incredible agriculture, and the nation would be a world military power, few would believe. Such prophecy would have been unbelievable. There is no nation in history that was twice destroyed. The people en masse were twice taken captive of the land. The last captivity was for 1900 years. What force has kept this nation, even though they were scattered into the world for 1900 years? What force has kept the Jew from being completely destroyed, through Pogroms, Crusades, Holocaust, and all the other attempts to destroy them? The re-birth of this nation shows the authority of the Bible as the Word of God ~~~ It shows the invisible Hand of God to fulfill His Word. The everlasting Covenant is in effect. God’s Covenant is that force that has kept Israel through the centuries. According to the Bible, these are the latter days (Amos 9:15). When the Islamic nations came against Israel and Jerusalem they will be destroyed. God has warned beforehand, what will happen when armies try to destroy and take Jerusalem. The entire world will see the mighty power of God, as he uses Israel as His anvil. To have a clear understanding of this, we need to remind ourselves of the miracles that took place in the past. On May 1948, five Arab nations (Egypt, Syria, Iraq, Jordan and Saudi Arabia) attacked in an attempt to destroy the newly formed nation of Israel. These combined armies were defeated and the nation survived its very difficult rebirth. When the war ended Israel was in charge of two thirds of Jerusalem. Jordan controlled the rest of the city including the Temple Mount. In 1967, war again broke out. This war became known as the 6th Day War. In May 1967, Egypt and Syria mobilized their armies and threatened to attack Israel. The Egyptian army crossed the Suez Canal and headed toward Israel. Egypt demanded that the UN peace keepers in the Sinai leave and Egypt closed the Gulf of Aqaba to Israeli shipping. This action by Egypt was an act of war. On June 5th, the Israeli army attacked Egypt and Syria. The Egyptian and Syrian armies were crushed. 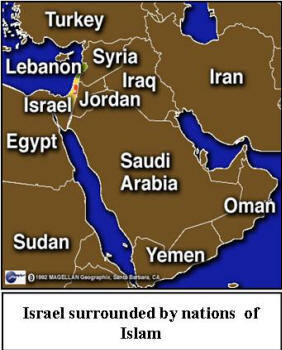 On the last day of the conflict Jordan attacked Israel. In one day Jordan lost Jerusalem and all the land west of the Jordan River. The tiny nation of Israel had become a world military power in only twenty years of existence. Just as predicted in the Word of God all of Jerusalem was again under Jewish control. God’s unseen hand was working in the affairs of men to fulfill the everlasting covenant. Phase one of the plan is the establishment of an independent combatant national authority as a state consisting of Gaza and the West Bank (Judea and Samaria). Once established, Gaza and the West Bank will serve as a launching pad for Phase two, the provoking of all out war, in which the Arab nations plan to wipe Israel off the map. Palestinian / Arabs still blatantly broadcast their plot from behind the scenes. Not quite so covertly, their Government logos and websites show Palestine encompassing all of Israel, with Israel non existent. Does the government of Iran actually want war with Israel so that the Mahdi can return? As insane as that sounds, the truth is that the vast majority of people simply do not understand how absolutely obsessed Mahmoud Ahmadinejad and others in the Iranian government are with their form of radical Islam and with the return of the Mahdi. Iranian leadership also believe that they are setting up the great cataclysm which will bring about the return of the Mahdi. Many of them seem perfectly willing to die in order to fulfill this purpose. During a speech in Tehran, Ahmadinejad reportedly stated that his primary purpose in life is to "pave the path for the glorious reappearance of Imam Mahdi, may Allah hasten his reappearance." And, considering the fact that Ahmadinejad believes that his life purpose is to usher in the return of the Mahdi, many believe that Ahmadinejad is actually looking forward to the coming war with Israel. But he doesn't want to start the war. He wants Israel to start it! So just who is this "Mahdi" supposed to be? According to Wikipedia, Shi'ite Muslims "believe that the Mahdi is the Twelfth Imam, Muhammad al-Mahdi, the Twelfth and last Imam, who was born in 868 AD and was hidden by Allah at the age of five." It is believed that the Mahdi will one day return during a very cataclysmic time in human history and will establish the rule of Islam around the world in the last days. So what does Israel do? Take the bait and start a cataclysmic war that could unite all of the Islamic nations in the Middle East against them? Or continue to watch Iran get closer and closer to developing nuclear weapons which they would certainly end up passing along to terrorists and to other enemies of the Jewish state? But, ultimately however, the Lord has other plans for His chosen people. Time after time, man thinks he has the solution, and God responds by proving that His ways are not the world’s ways. Plans for a combined invasion by Syria, Hamas and Hezbollah ~~~ There are persistent rumours that Hezbollah, Hamas, Syria and Lebanon are preparing for war against Israel, possibly the coming months ahead. Intelligence has discovered 5,000 Hezbollah terrorists that have been trained to take over and seize the towns during a future invasion of Israel. Apparently the invasion plans that have been drawn up involve sending five Hezbollah brigades sweeping across the Israeli border to seize key towns in the region of Galilee. Hamas would open a second front in the West Bank and Gaza, and Syria would then step into the conflict at that point. Think that it can't happen? The truth is that Hezbollah has been rearming since the last war. Hezbollah has acquired chemical and biological warheads since then, and there have been reports that they have stockpiled over 40,000 rockets near the border of Israel. Just recently, Hezbollah has deployed advanced surface-to-surface M-600 which have the range to cover the entire nation of Israel. The militants regularly receive training in Syria and Iran and the Hezbollah terrorist organization is essentially in control of large areas of Lebanon at this point. They are a highly organized and increasingly dangerous military threat. For years, Syria and Iran have used Hezbollah to wage a proxy war against the state of Israel, and Israeli officials are starting to get sick and tired of it. In fact, one top Israeli official recently made it perfectly clear that in the event that a war between Israel and Lebanon does break out, Israel would hold Syria just as responsible. The truth is that someday a conflict between Israel and Hezbollah will involve Syria and it will be an incredibly destructive war. Let us just hope that it does not happen any time soon. In recent years, most of Arab nations openly avowed to be enemies of Israel, and have obtained weapons of mass destruction. More ever, China is now supplying arms to Libya, Iran and Syria while Russia continues to supply weapons to Syria and has recently signed an agreement with Iran and Libya. Much of the West is still in complete denial about how incredibly dangerous radical Islam is. The truth is that those who are committed to "jihad" have a mindset that is totally and completely different from the west. There is no compromise, no negotiating and no lasting peace with radical Islam. Yes, radical Muslims may make a temporary treaty in order to improve their strategic position, but it will never result in lasting peace. To them, there are really only two alternatives for "infidels" like us - either submission to Islam or death. Another huge misconception about radical Islam is that it is a "Middle Eastern" thing, but this is not true in fact it is worldwide, and violence against Jews and Christians is likely to get worse as we get even deeper into the last days.